In this special episode I’m joined by Pat Loika (Loikamania!) to discuss two comic book movies that came out this summer. 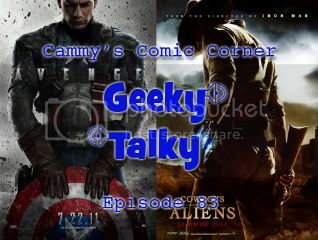 We talk about Captain America: The First Avenger and Cowboys & Aliens. Spoilers! This month, The Freaks offer up a TREASURY-SIZED edition of Comics Monthly Monday! The Stupid-Bowl is over (Thank God! ), but at least we got some great trailers for upcoming comic movies — Thor, Captain America, and X-Men: First Class, among others – Hear what our goony trio thinks of them! Mike Bailey attends a one-day comic convention and runs into a wall of CON FUNK. A public service announcement ensues. Chris gives his book report on the MYSTERY SUPERHERO COMIC that Mike and Scott had him read. Scott muses about whether Marvel and DC will ever be under the same roof and Michael muses about what Scott has been smoking. And- FINALLY – THE TRIUMPHANT RETURN OF THE WALKING DEAD! This month it’s issue #31! This episode is a rerun that originally aired September 8th, 2008. The Freaks discuss some of their favorite television shows that may have fallen through the cracks. Join Chris Honeywell and Scott H. Gardner for list of idiot-box presentations that have either been forgotten, overlooked, unfairly panned or just plain ignored — but are well worth your attention.